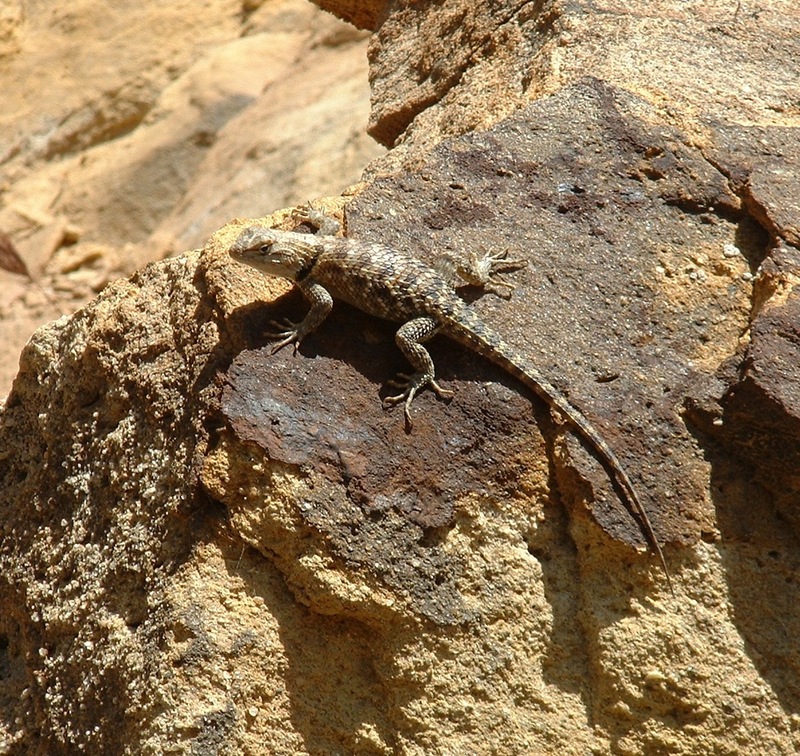 Here are four species of lizards that I’ll call “special” here since I was able to photograph them my first time. 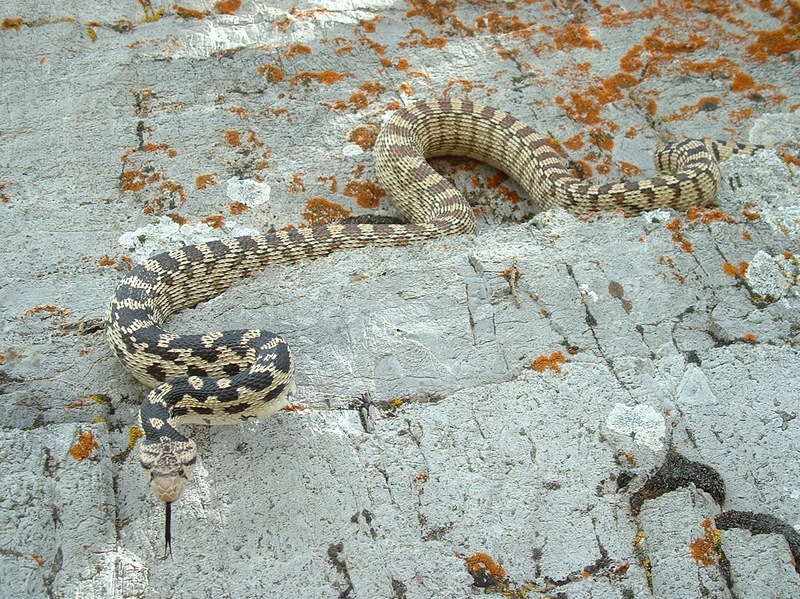 The first two of these four species here I had never seen in Utah before. 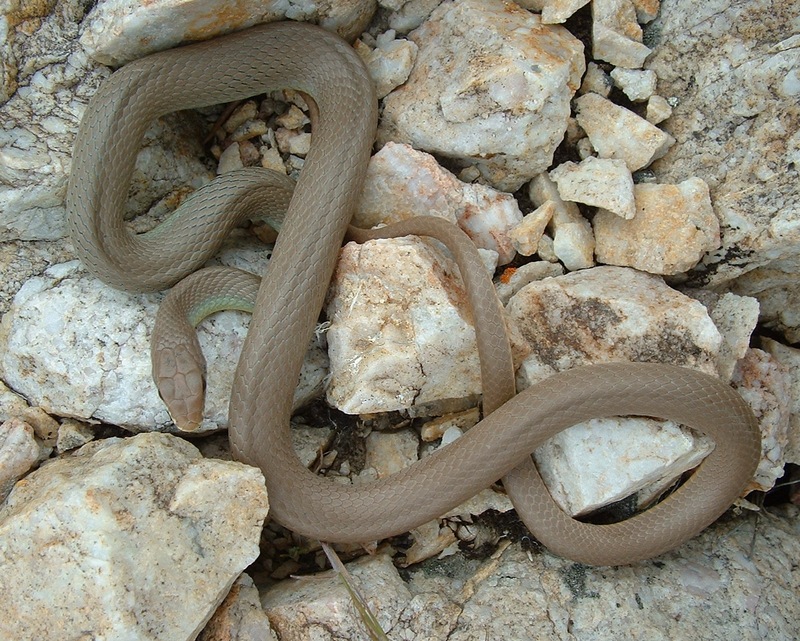 The second shot above is of a different specimen than the first. 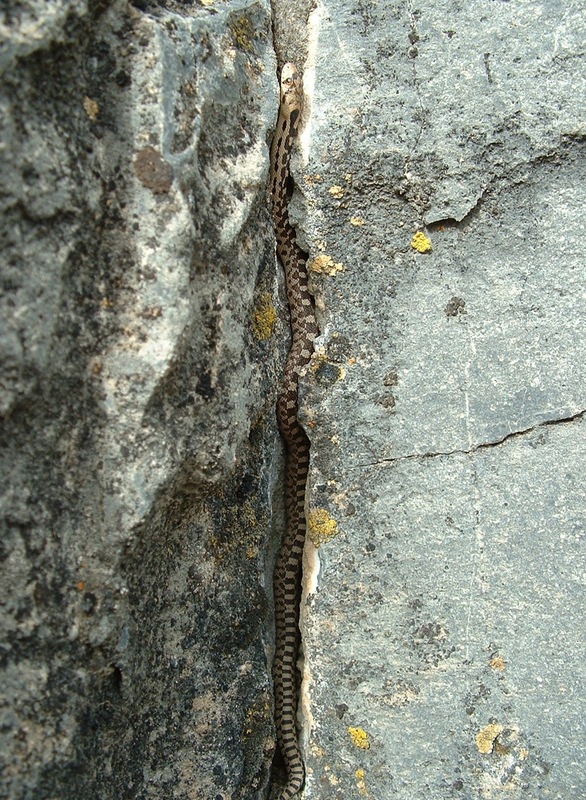 These were in crevices late in the day, and I’ve still never seen one outside a crevice. 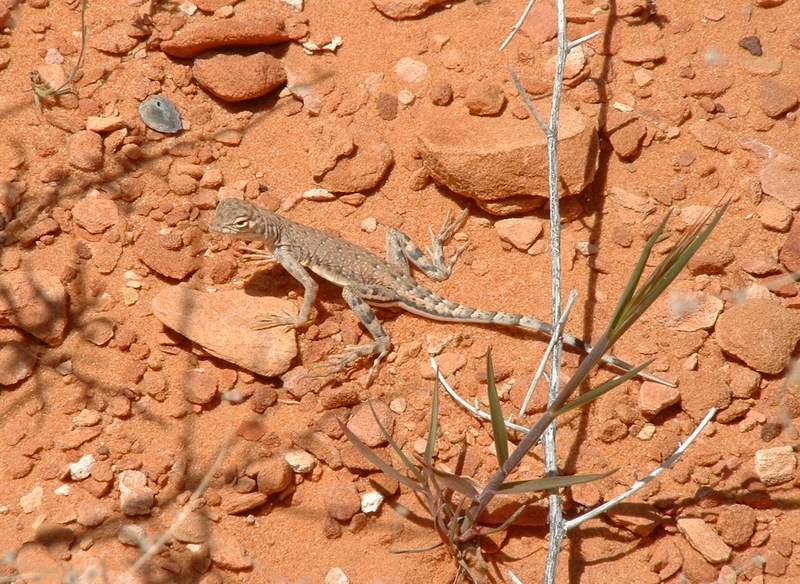 I had seen zebra-tailed lizards in Arizona, but a couple I found here in this open, sandy area were the first I’d seen within Utah. 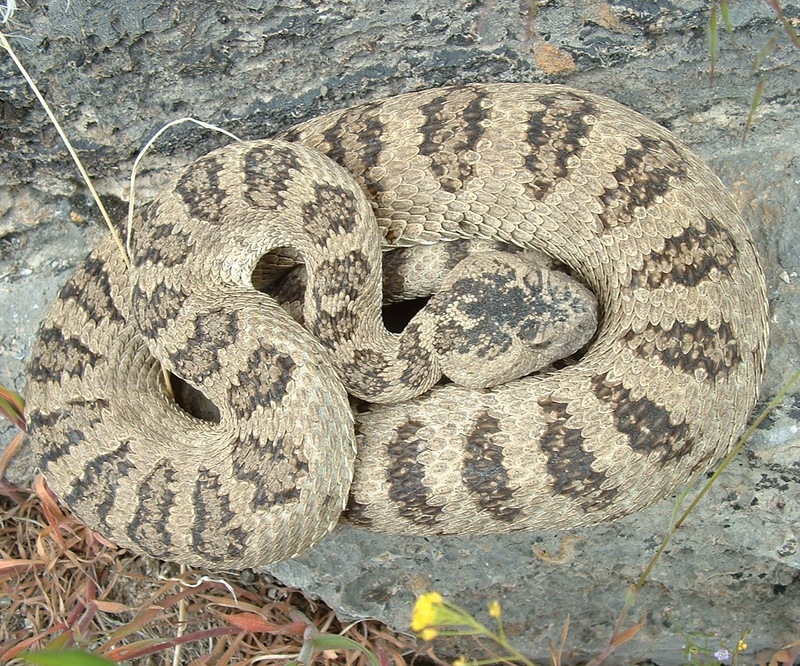 I have seen this species in earlier years along the foothills of the Pine Valley Mtns, but this subadult was the first one I’ve photographed. 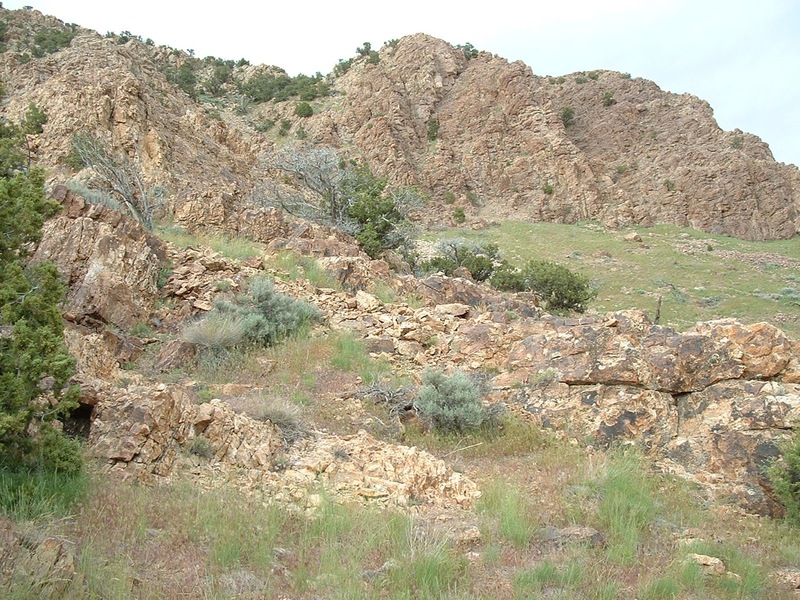 This was the fourth area in Utah where I’ve seen plateau striped whiptails. 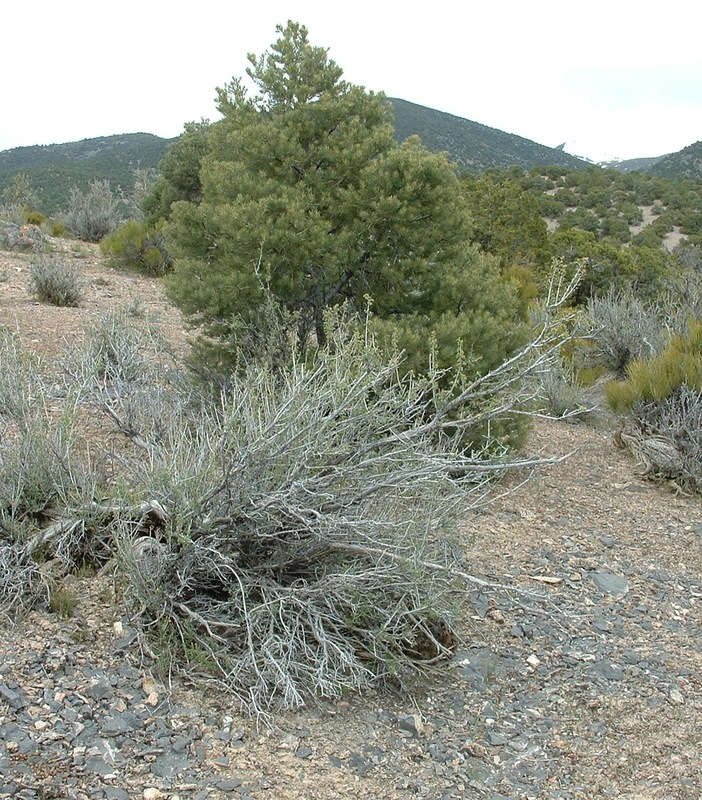 At the three other spots, I found them rustling through fallen oak leaves; but here on this walk I learned they can also be found away from oak, in habitat such as this pinion – juniper – alderleaf mahogany habitat. 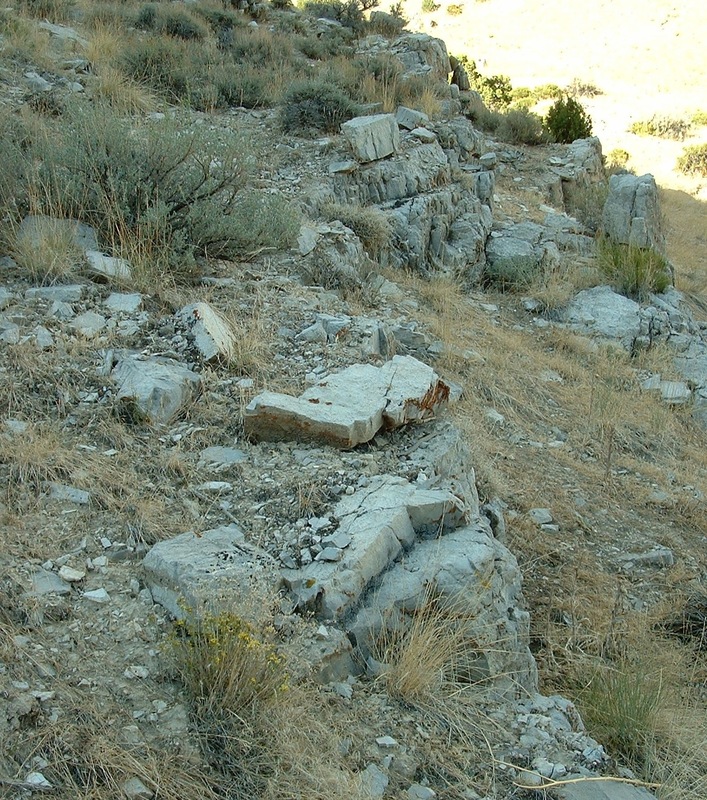 But, there were patches of oak within 200m of this spot. 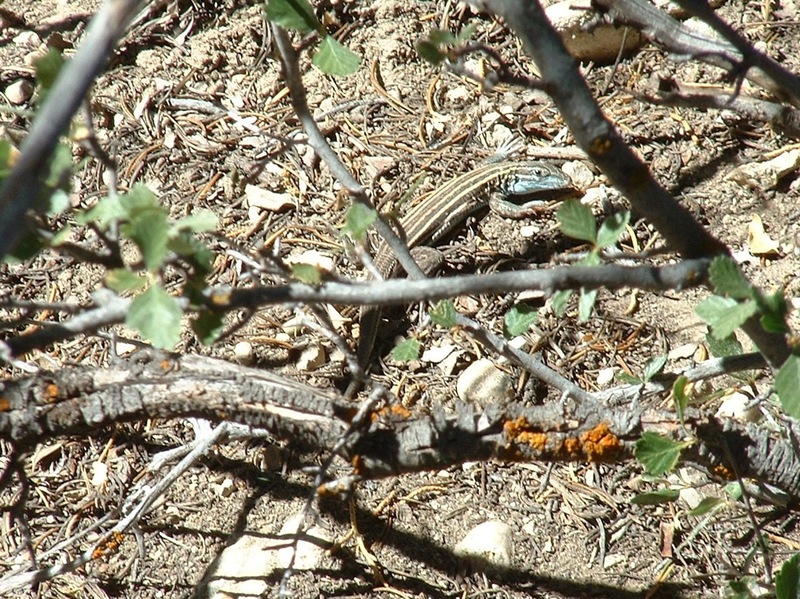 This is Utah’s all-female (parthenogenetic) whiptail species. 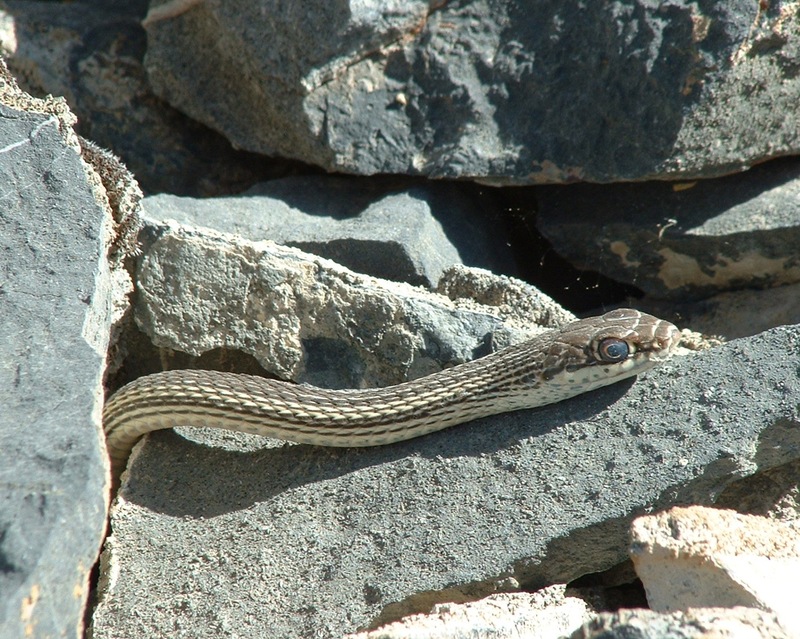 Like all whiptails I’ve encountered, the two I saw at this spot were skittish & difficult to photograph. 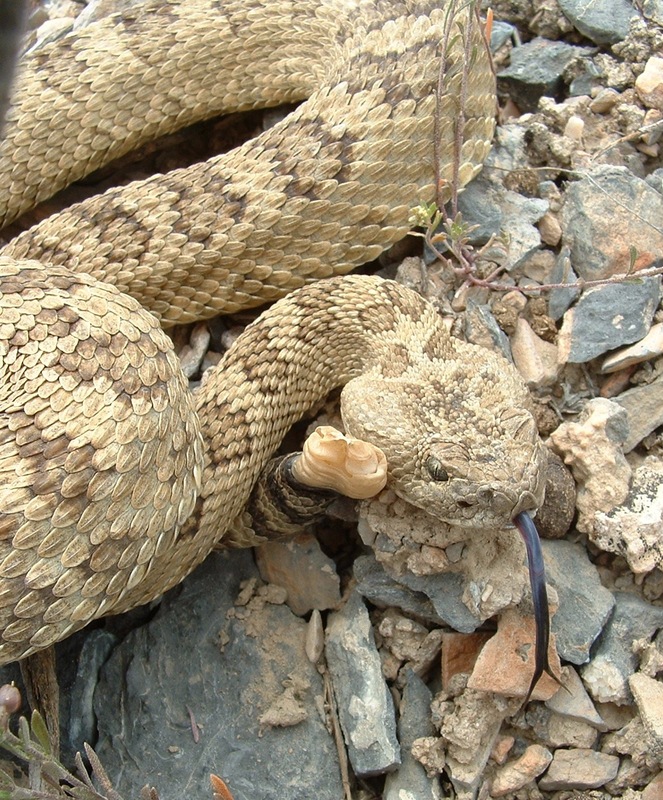 Across these two seasons, these are rattlesnakes I saw in situations where photos were easy. 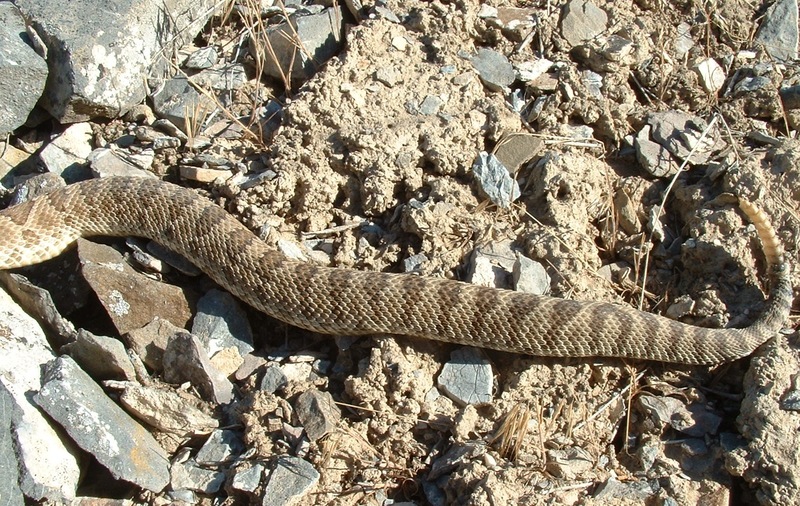 All these are great basin rattlesnakes, Crotalus lutosus, seen in the western half of Utah. 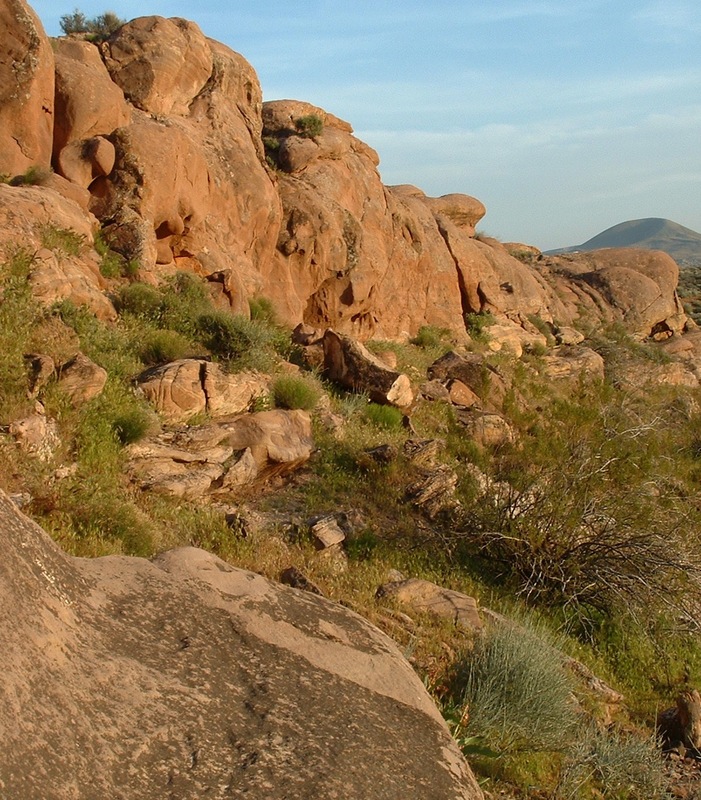 This old adult down below 3,400 ft elevation shared its habitat with desert tortoises, banded geckoes and chuckwallas, and perhaps also gila monsters and sidewinder rattlers. 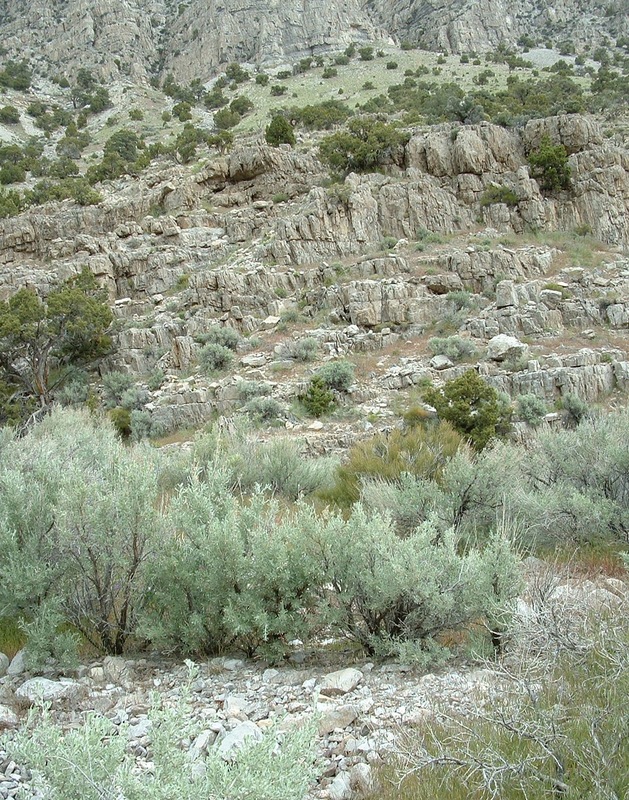 Such habitat constitutes the lower-elevation end of this rattler species’ utilized habitat. 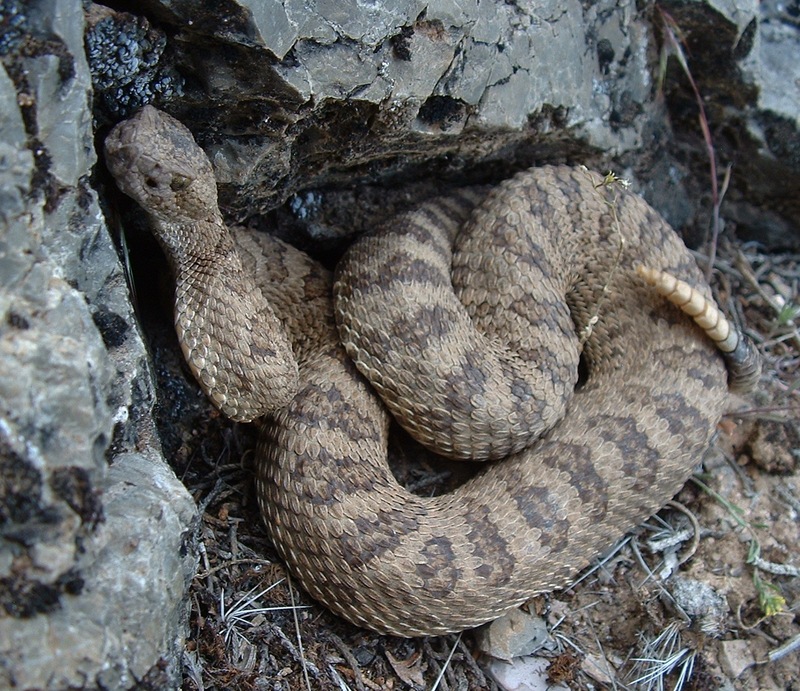 In Utah this rattler species spans up through ~8,000 ft elevation where the habitat is far different than this specimen’s lower & hotter desert habitat. 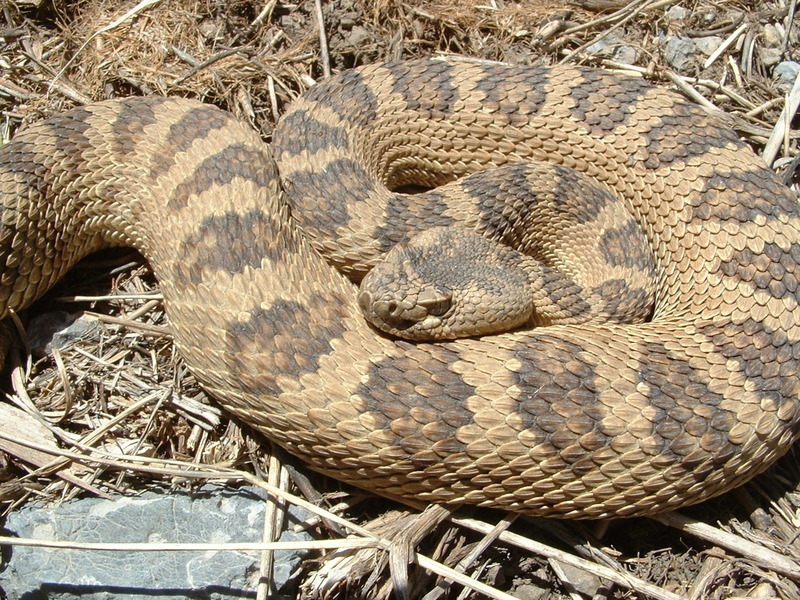 Most snake species have narrower habitat requirements than the great basin rattler. 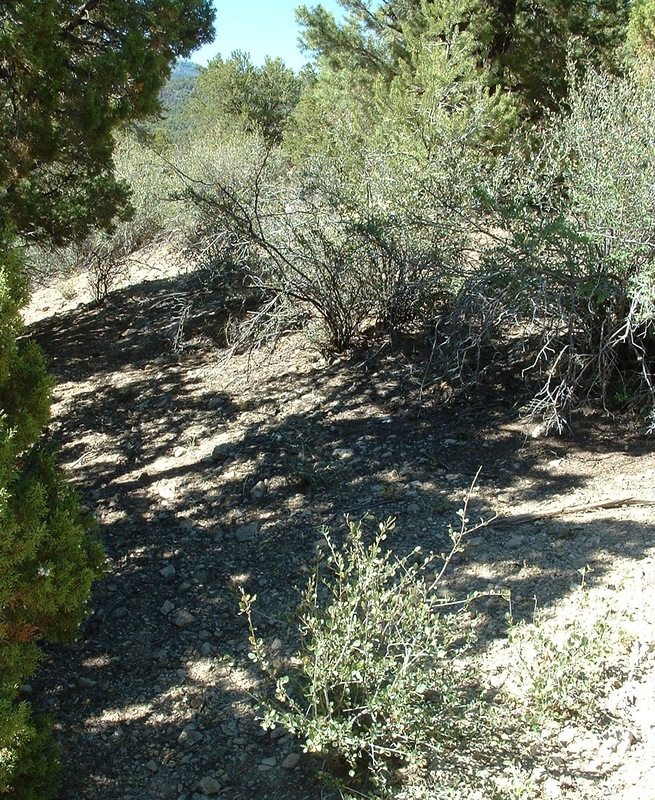 Here, I found a large adult resting in the dappled shade of this shrub. I consider this photo above the best one of this post. 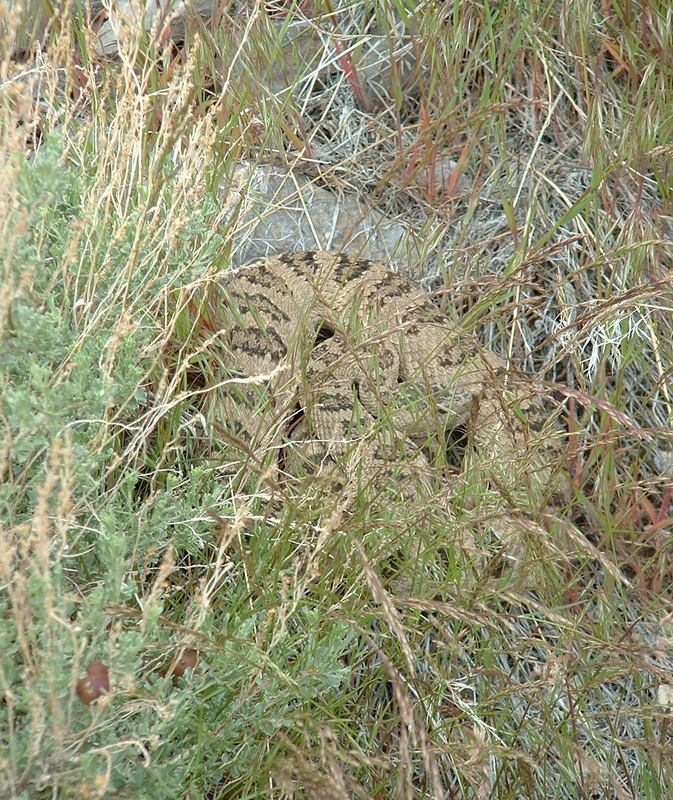 Maybe someone more knowledgeable about rattlesnakes can offer a better opinion, but I think this motionless position that I recorded may be an example of its “ambush position”–when a rattler coils on a rodent’s trail and waits, head cocked to strike. 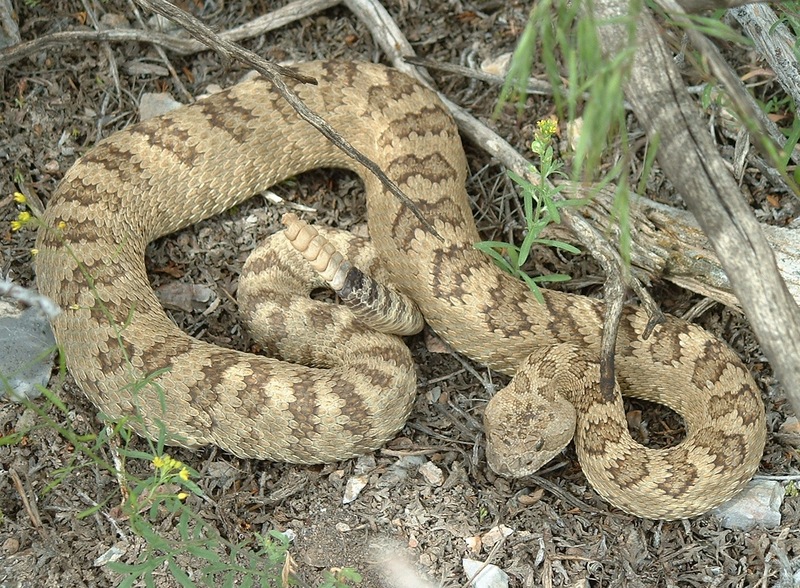 There have probably been situations where I only noticed a rattler after my presence had disturbed it out of its ambush position. 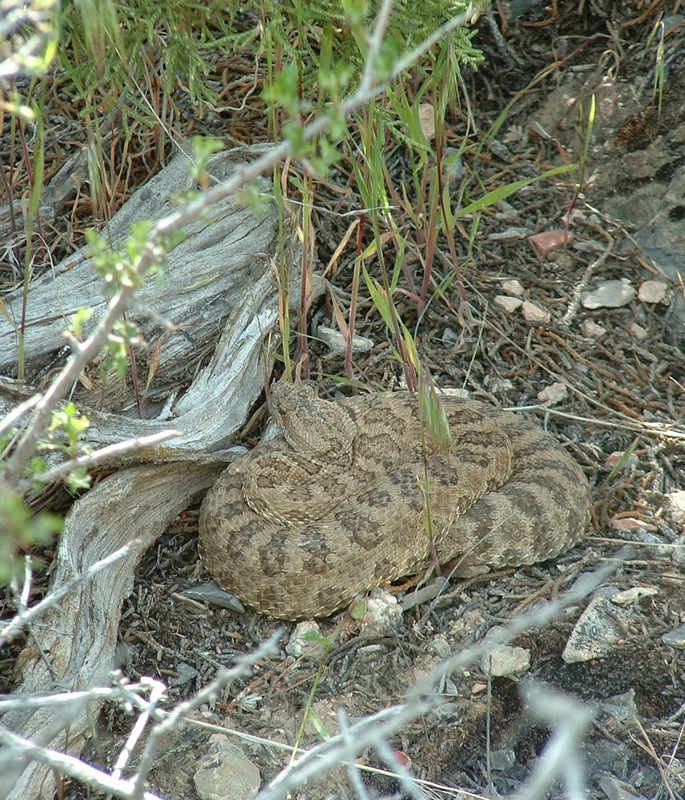 But this one I noticed from a distance and was able to obtain this photo before my presence caused it to shift position. 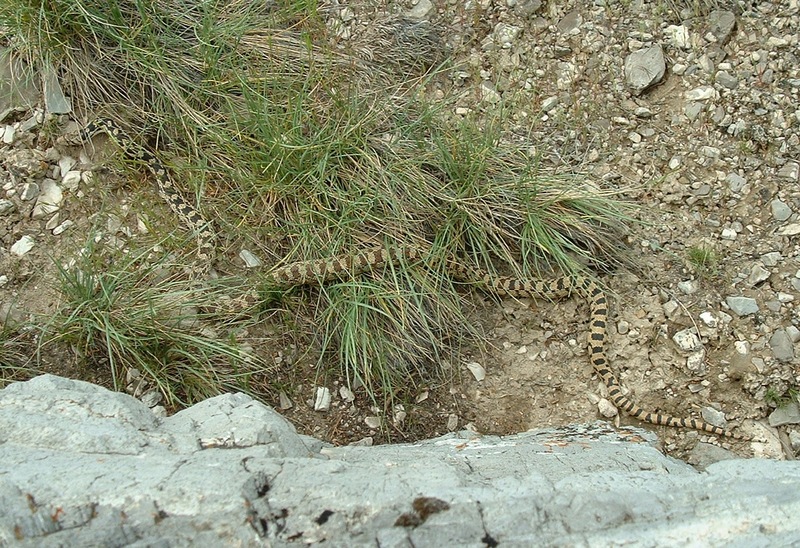 I noticed this little snake (that I’d guess was the previous fall’s newborn) as it moved slowly at dusk on rocky slope. 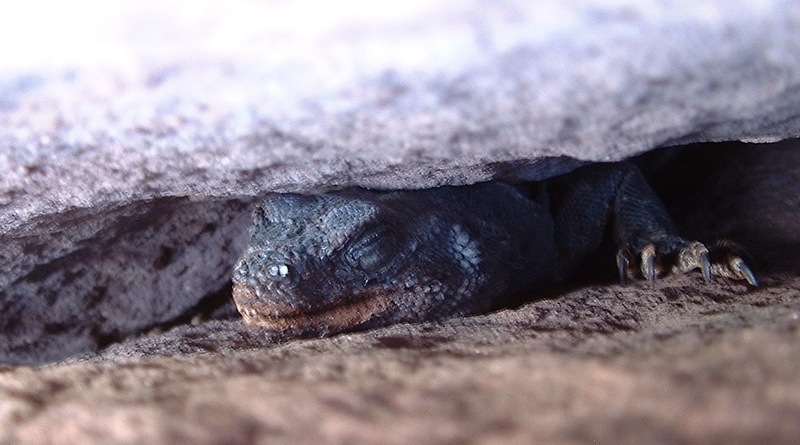 I suspect this small adult was a mature female that had been coiled & basking in the full sun during mid morning because it had developing embryos inside that it was warming. It did not seem to have a noticeable meal (a “food bolus”) inside. But its posterior, shown in the first photo above, seemed thickened a bit. What do you think? 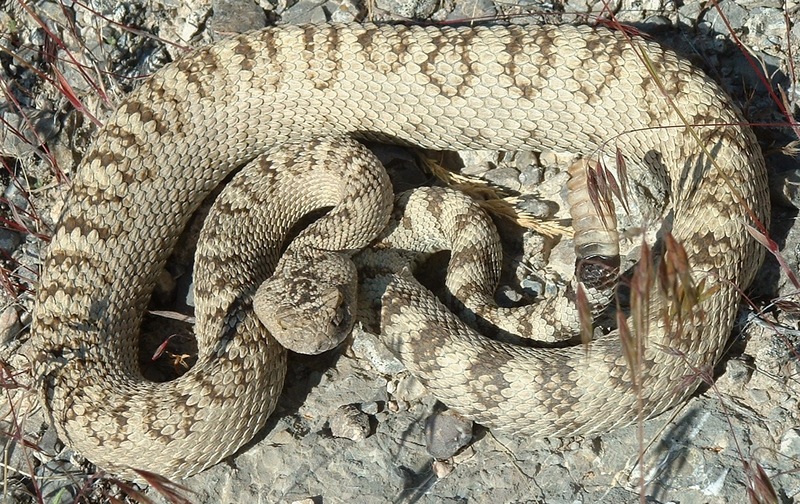 This adult was an example of a very calm, unperturbed rattler, as some can be. 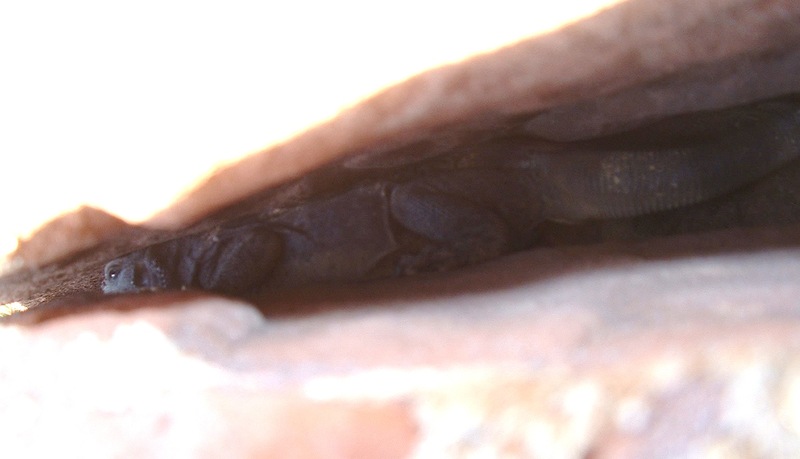 I did not notice her until my nearness began to disturb her out of her coil. 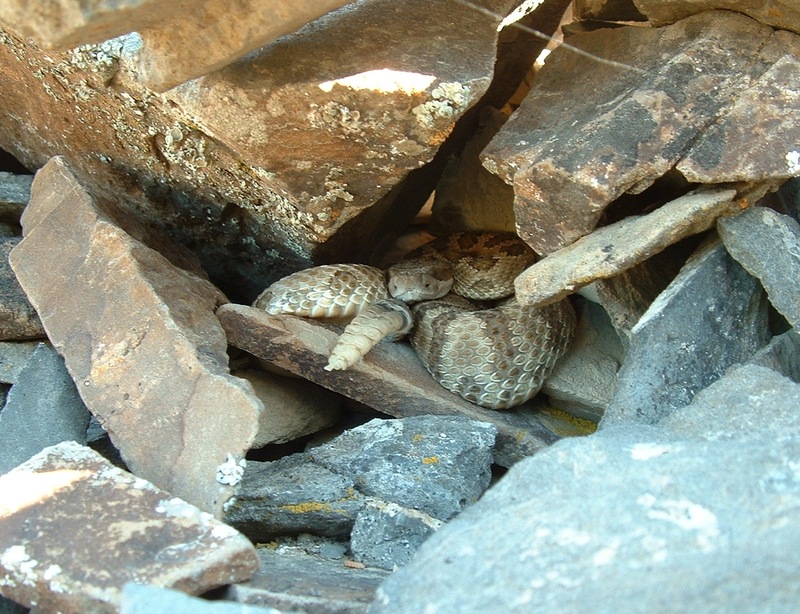 She never rattled, and simply moved slowly into the shelter of this nearby talus. There, she did not hide as deeply as she could have, but remained watching, as shown. 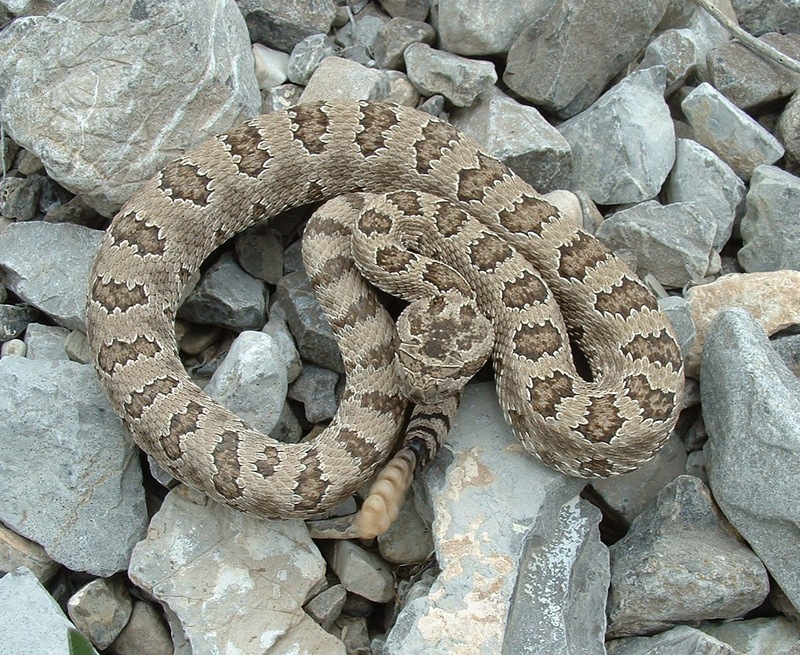 There, now you can see this baby rattler. My nearness has not yet caused it to shift position. 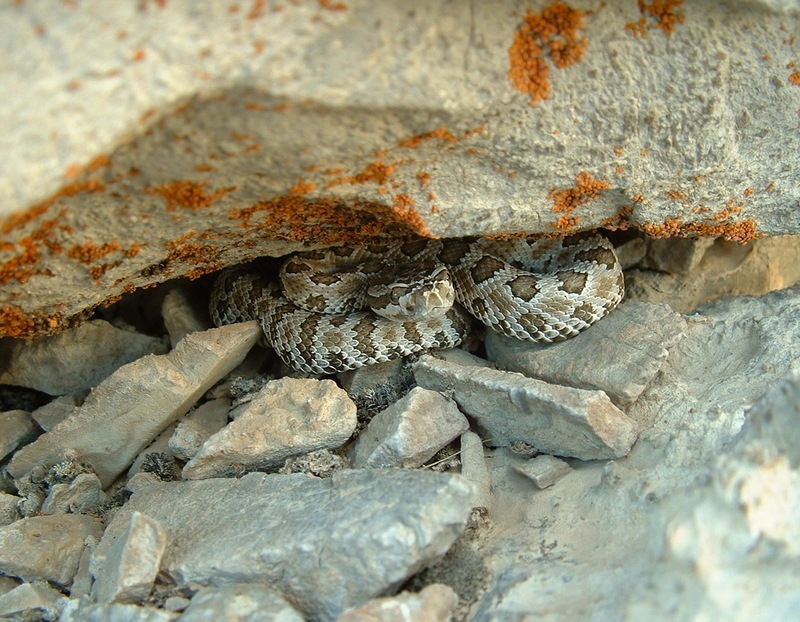 My photography eventually caused this baby rattler to retreat under the nearby rock, but I was pleased with this shot of it peeking out. 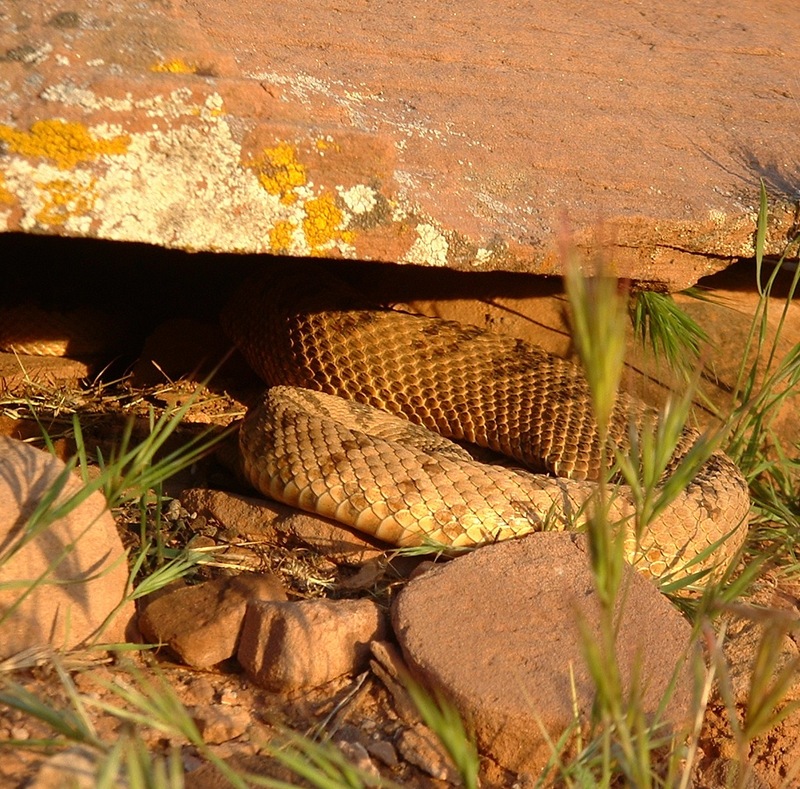 These are some nonvenomous snakes I came across during these two seasons. 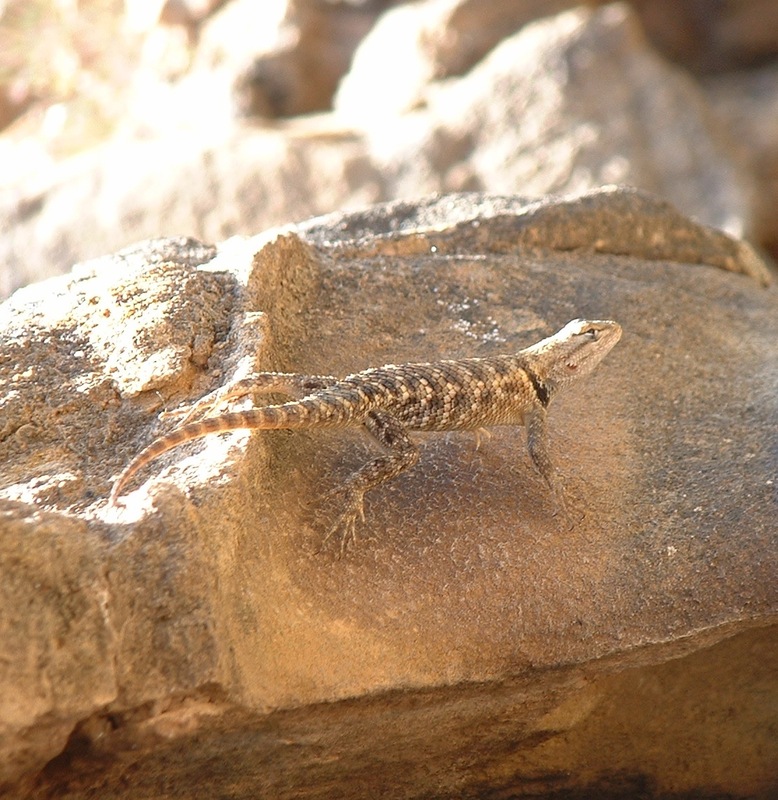 When I found her, I placed her up on a limestone boulder for photos. She was grumpy, as you can see here by her flattened, threatening head. This fourth & final shot is how she looked before I disturbed her. She was resting like this under a cloudy sky. 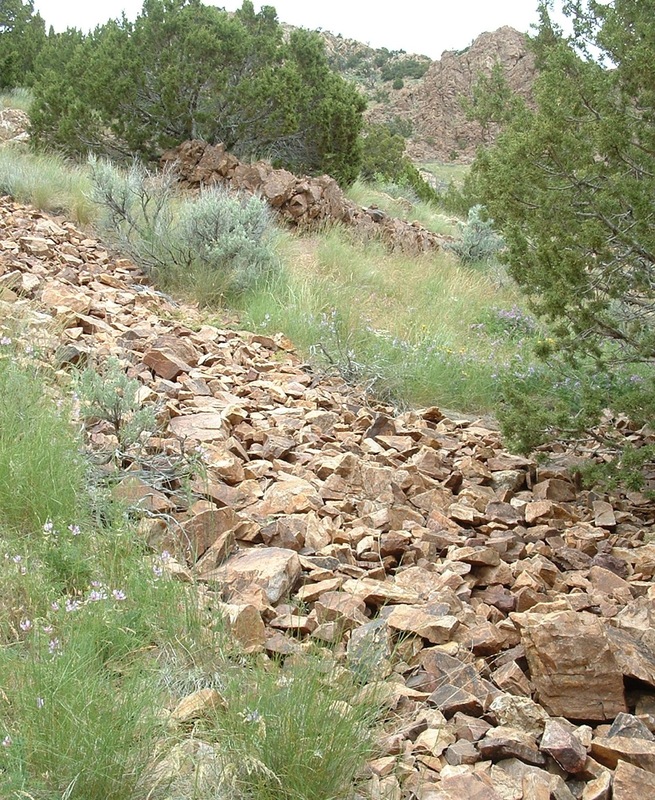 Here’s some likely-looking talus habitat–and below is the snake I discovered in it. This is the only decent shot I’ve ever obtained of a racer moving. They can speed along. 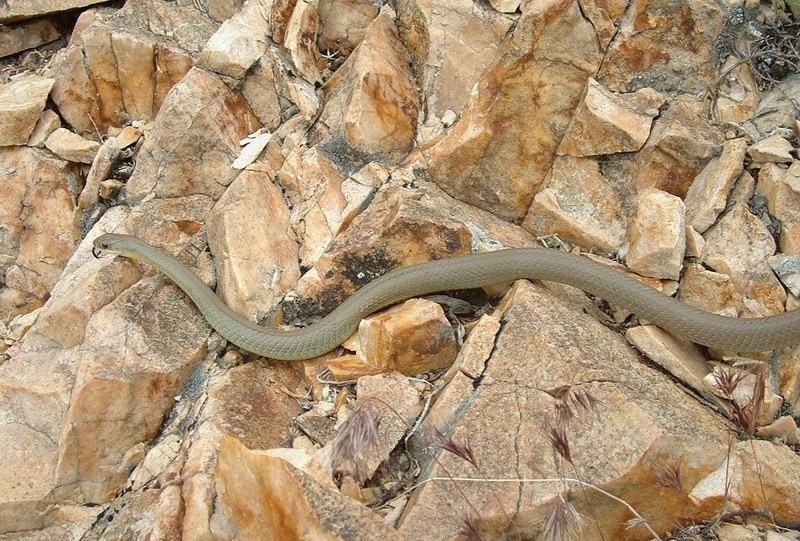 Although it might not be obvious, this is a different specimen–a male I found about 50m from that female above. 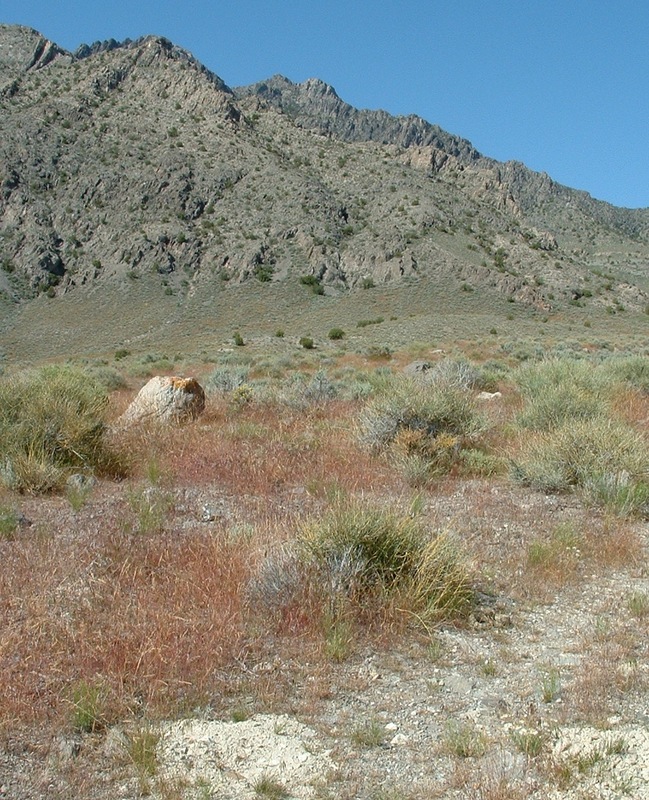 This shot shows these racers’ habitat. 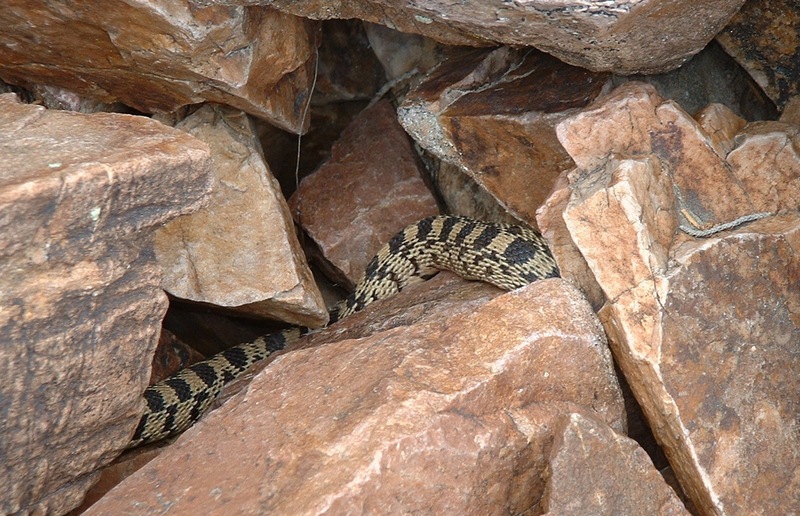 The female was along the rocks in the foreground. 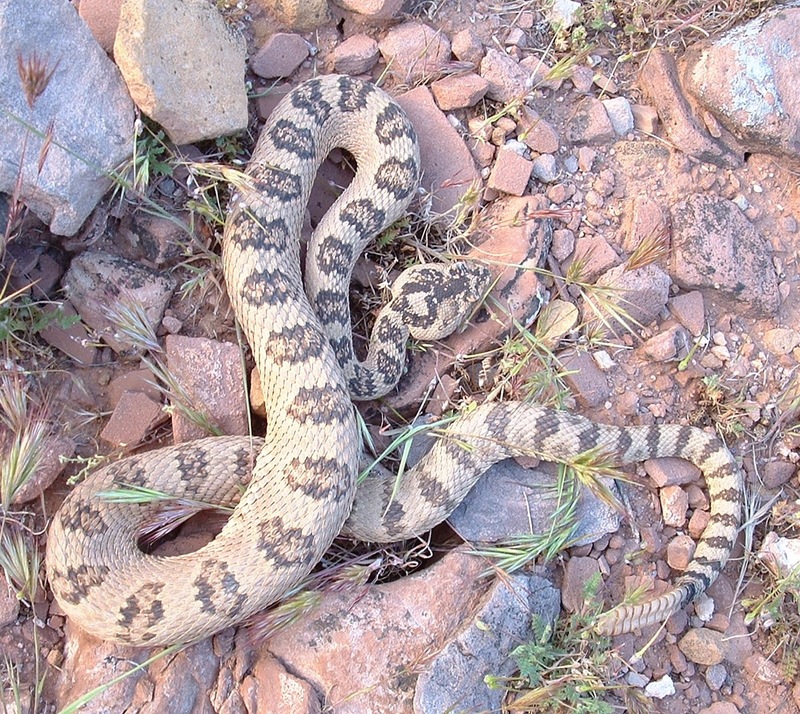 The male was in the grassier area farther back. 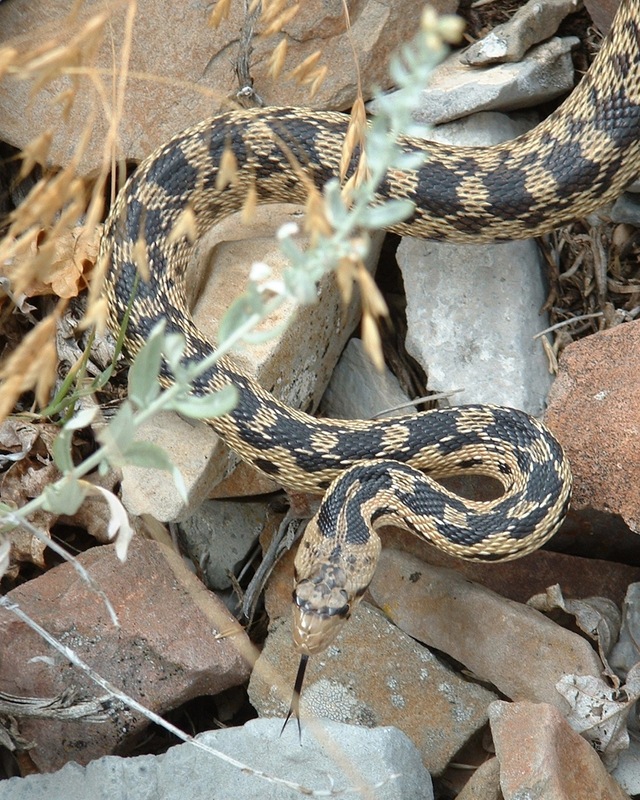 You thought this post was done with gopher snakes? Don’t think so. This skinny adult female looked to me like she might not survive the coming winter. But who knows? This shot shows her stub tail. 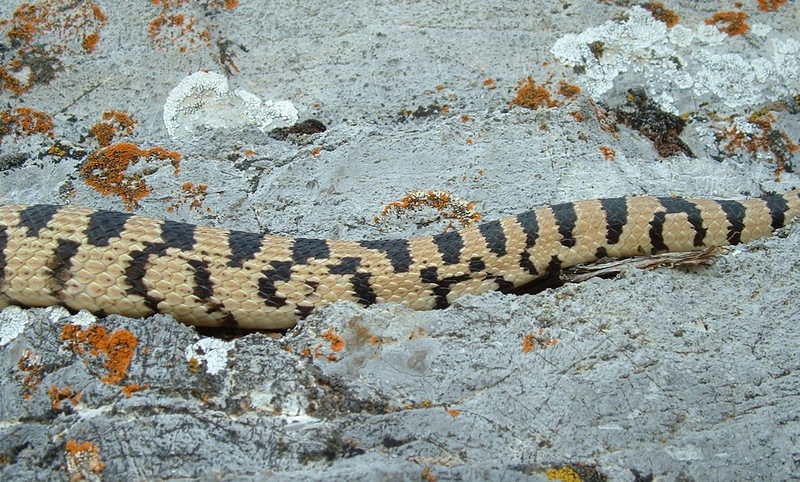 It also shows her orangish tint that most Utah specimens lack. 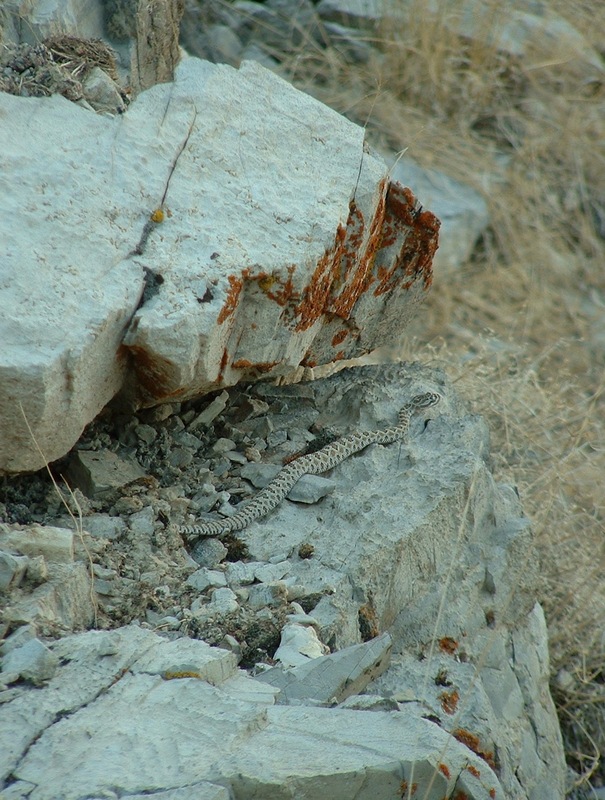 I found this little male moving on a limestone slope, and this shot in the crack was the best photo of him I managed. This was a somewhat odd find. 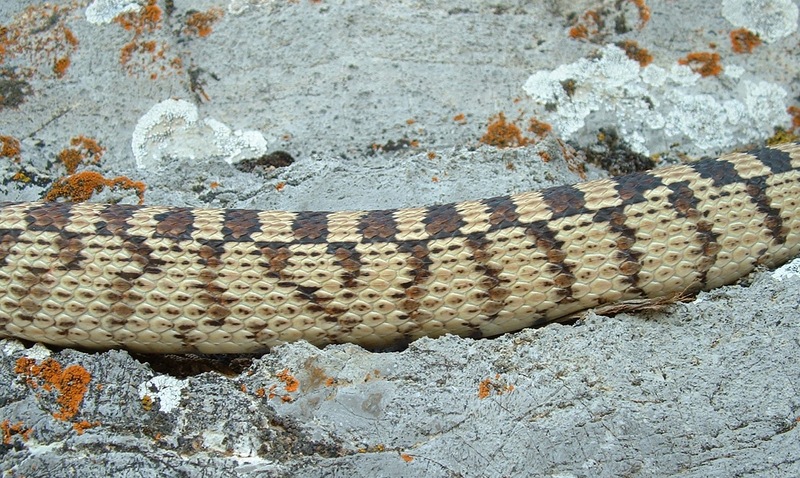 The bluish cast to the eye indicates this snake is in its pre-shed stage. 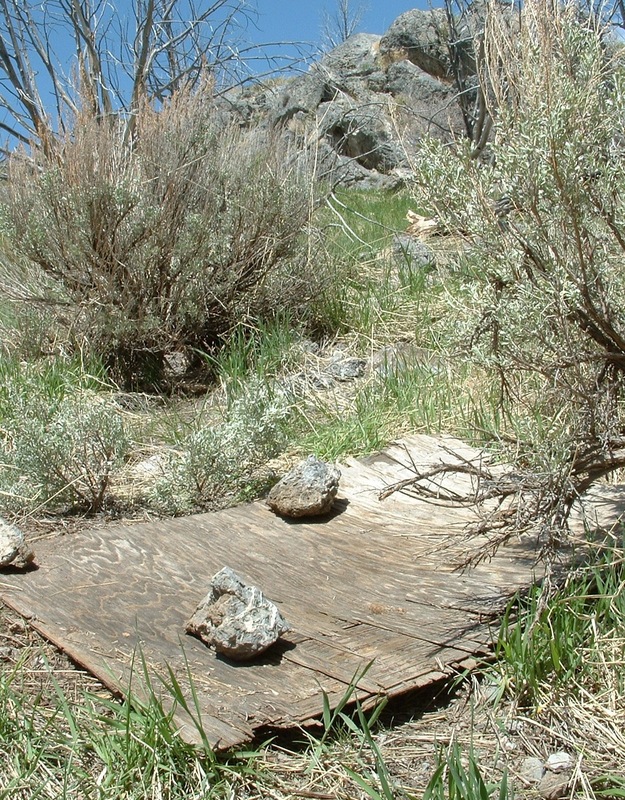 Usually, snakes in this stage are more likely to keep hidden. 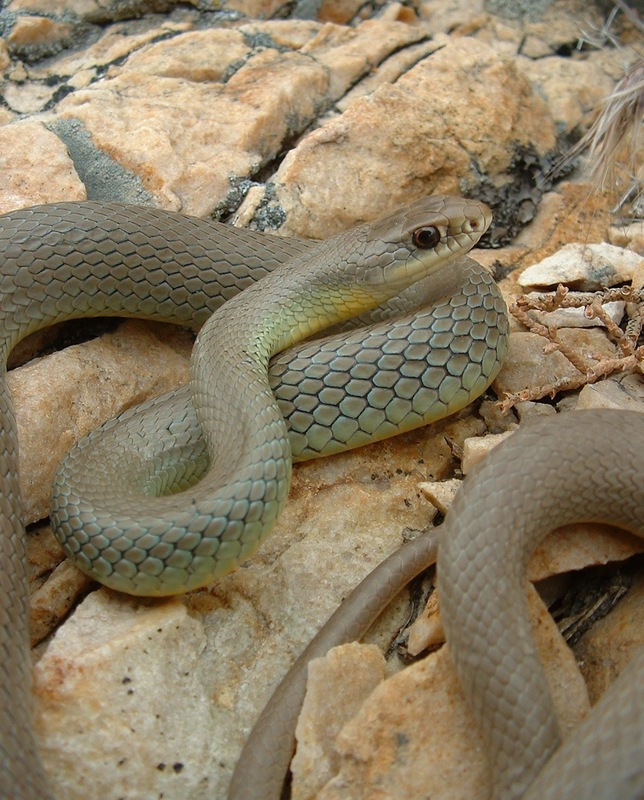 But this whipsnake was discovered just like this–warming out in the morning sunlight. 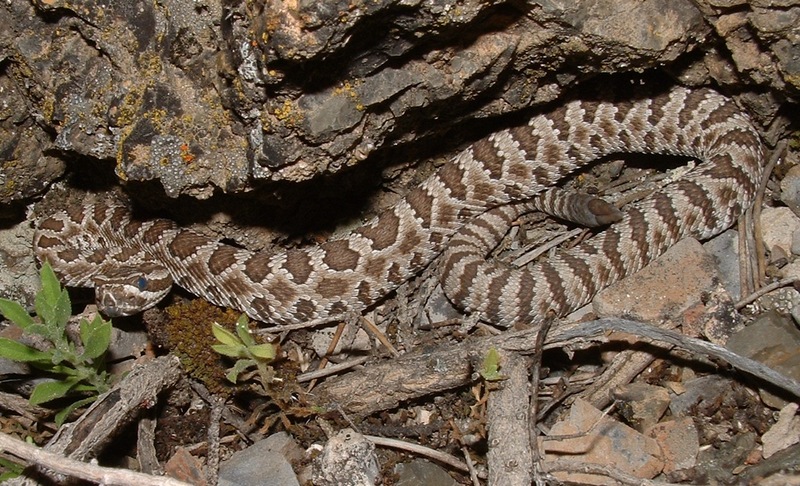 So, wild whipsnakes do not always stay hidden through their pre-shed stage. 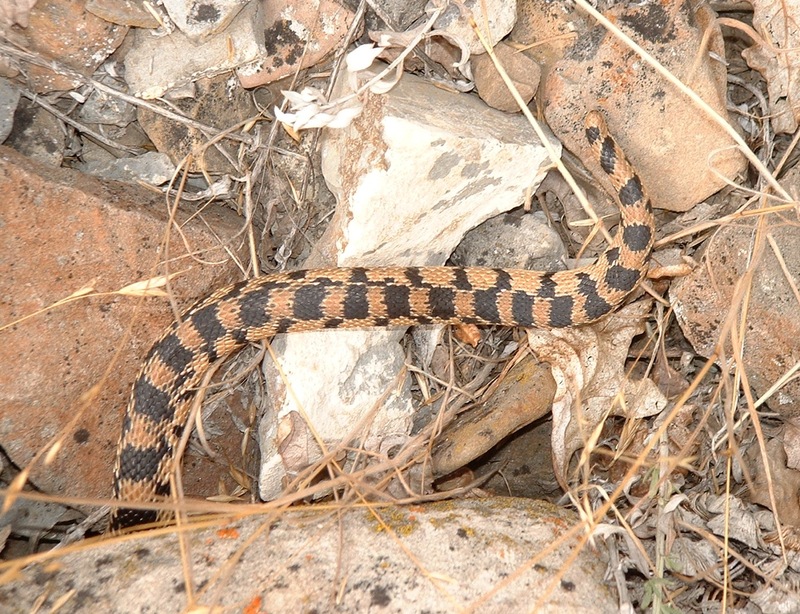 Another gophersnake? 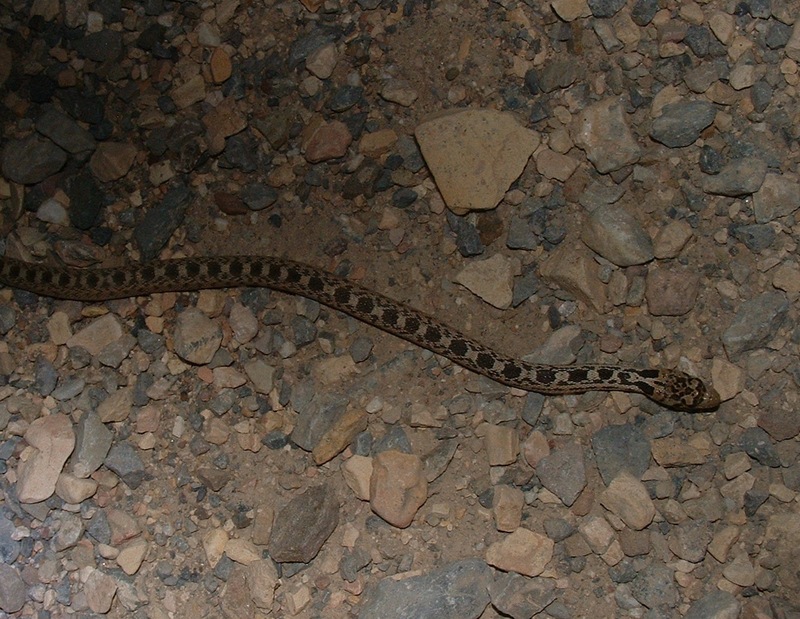 I see most of my snakes while hiking, but this is how they look when you find them at night on a paved road. 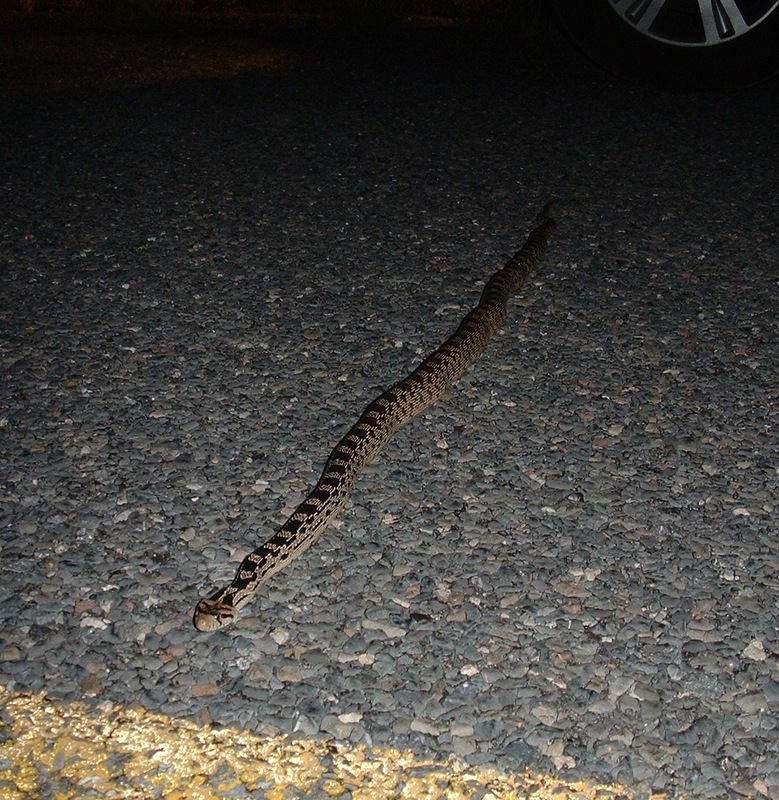 Many, like this one, are not inclined to flee when a vehicle approaches near. 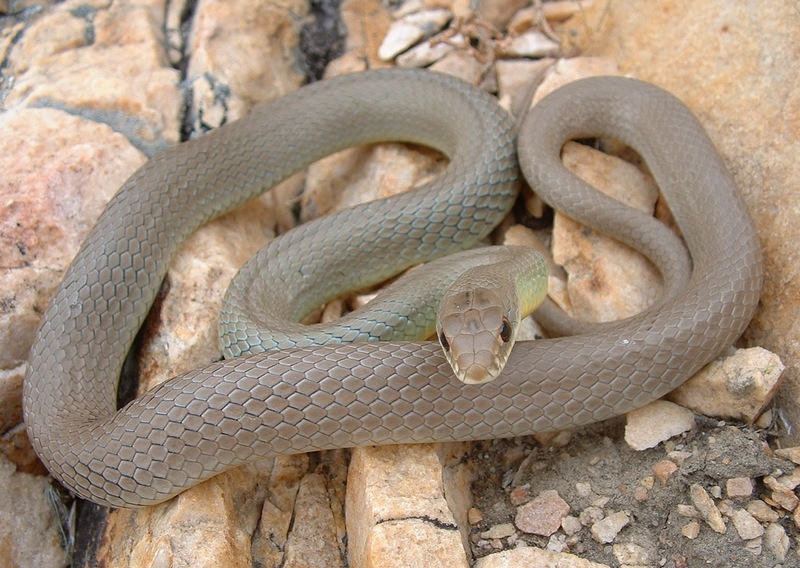 To finish, how about?…a gophernake. 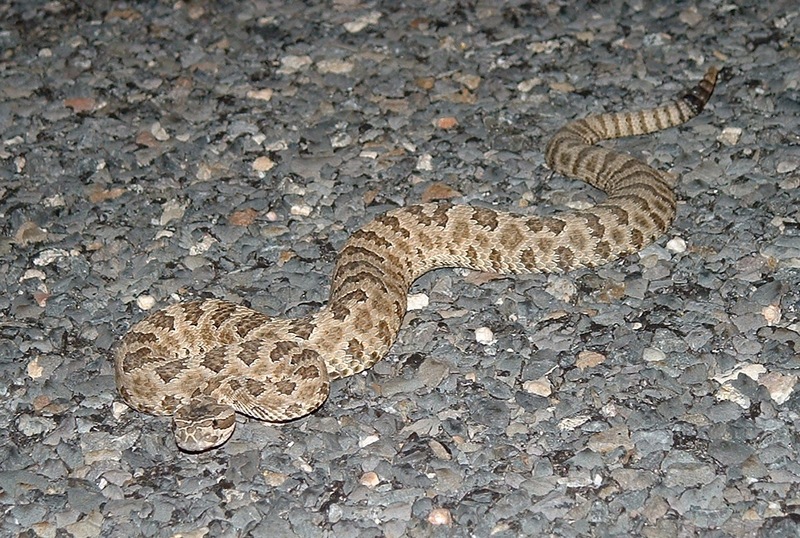 This hatchling was moving along a dirt road I walked up after dark.